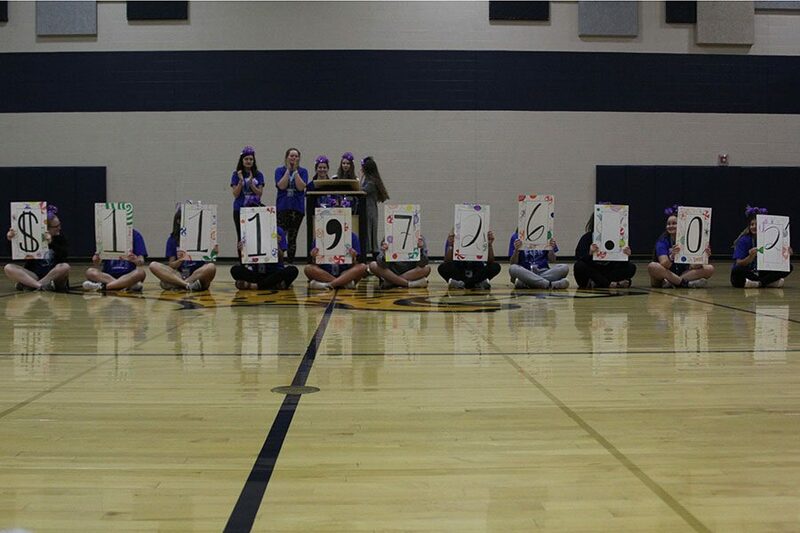 At the end of Relay For Life, the committee reveals the amount of money raised to be $111,726.02. Relay for Life raised $111,726.02 for pediatric cancer at the fourth annual event on Friday, March 29 through Saturday, March 30. The money consisted of money raised at Bark for Life, participant fundraisers and on-site fundraisers. According to event chair Abby Hoepner, the initial goal was much lower than what was raised. However, early in the planning process, they realized they could exceed that goal. “Our initial goal was to reach $80,000, but as we saw our student body raising more and more money and quickly approaching that goal, we started to hope for $100,000,” Hoepner said. Event chair Annie Myers believes that they were able to raise more money because of the extra effort given by participants. Hopener agrees, adding that the new trips to local elementary schools helped with the fundraising total as well. “I think it was very successful both in terms of the fact that we were able to raise well beyond our goal but also I was personally really excited to see that our involvement with the elementary schools paid off,” Hoepner said. Overall, Myers is excited about how successful the event was.